I have been sorting through my records on my distasteful experience with Civil Air Patrol. Could you add this to your archive? I know one IG who had the integrity to report that the [Southeast Region Commander] violated a number of regulations in one particular matter. Unfortunately, the report went to the NTL CC, who treated it as his personal property and refused to let anyone – not the NEC, not the NB, not even BoG members – set it. 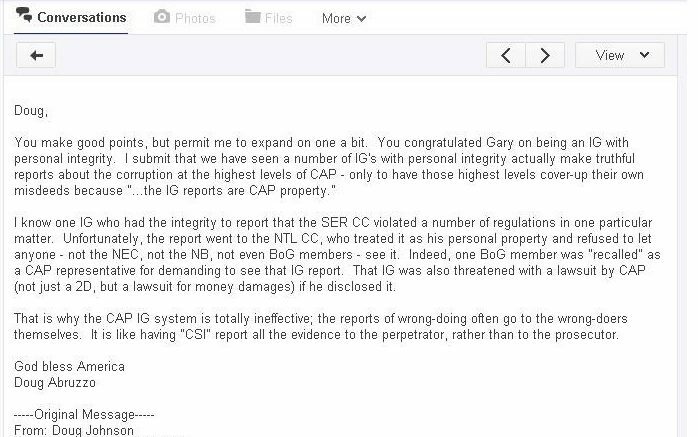 Indeed, one BoG member was “recalled” as a CAP representative for demanding to see that IG report. That IG was also threatened with a lawsuit by CAP if he disclosed it. That is why the CAP IG system is totally ineffective; the reports of wrong-doing go to the wrong-doers themselves. It is like having “CSI” report all the evidence to the perpetrator, rather than to the prosecutor. Be the first to comment on "Decades of Corrupt CAP Commanders and IGs"